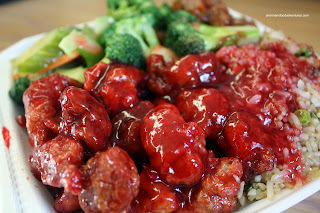 Manchu Wok, Flaming Wok and Panda Express. Probably the antithesis of authentic Chinese food; yet ultimately usually the most popular food stand at any food fair. Is it that people do not know what real Chinese food looks and taste like? Maybe they don't really care for real Chinese food. Possibly the quantity of food for the money is considered good value. Maybe people are attracted by the grease and neon coloured sauces. Whatever the case, the Chinese food stand is a staple at every food fair where the only decision is whether to order a 3 or 4 item combo with rice or noodles. For me at least, I can tolerate Westernized Chinese food. I belie ve that whatever we eat, it has to be prefaced with a dose of real expectations. So, I know not to expect much while dining on this type of food. However, even with that being said, if the food just plain stinks, well... it really doesn't matter what it is. Seeing how there is little else in North Delta for me to try, I headed over to Scottsdale Mall and visited their modest food fair. When I say modest, I'm talking about 3 food stands. So, there really isn't much in the way of options. That would probably explain the lineup at Hang Lee Wok. Much like the others, you have your rice, noodles, sweet and sour meats, BBQ Pork, stir fried veggies, spring rolls and other fried items. I went for the full meal deal and opted for the 4 item meal. I got Fried Rice, Sweet n Sour Pork, Sesame Chicken and Stir Fried Veggies. After paying, I attempted to pick up the styrofoam container and it was heavier than Tiger Wood's sinking career. It was so heavy, I almost dropped the darn thing on the floor. Now, being good value is one thing; but the food wasn't very good, even for Westernized Chinese food. The meats were fried to the point where it was hard and dry. The sauces were predictably greasy and radioactive in colour. I did like the vegetables as they still retained their colour and crunch. The fried rice was... well, prepared fried rice. For what it is, it's a good value considering the quantity of food you get. However, I wasn't exactly thrilled with textures or taste. I wasn't even close to finishing it and probably it was a good thing. Yah, Kent's Kitchen it is definitely not! Zud, you are absolutely right. Crystal Mall, Yaohan, Aberdeen, Parker Place and Richmond Public Market have so many unique food stands. In a short walk from my hotel to the zocalo here in Guadalajara, I passed, at a minimum, six Chinese buffets. The steam tables are always right by the front window. Put simply, not good...unless you like hot dog in your chow mein. Hang Lee Wok is ultra high end haute cuisine by comparison. Yes Karl, it's all relative eh? eek, i think that sauce is downright scary. there is something very unnatural about the redness to it. however the green beans look delicious... mmmm! lol omg bahahhaha this post makes me laugh.....Being a "Seaquam girl" I totally am familiar with the Scottsdale food court!! my friend actually read this post and bbm'd me "did you tell Sherman to go to YamaYaki's instead of Hang Lee Wok? "...It was hilarious! Yes Trisha, the colours are just too vibrant! Mijune, that's hilarious! Yes, don't we go through phases early on in our lives and accept whatever we eat as good? We know better now!